With the recent removal of the trees from the other block the tree loppers had a load they needed to dump elsewhere before they could make a start on the rest of the block. So I asked for them to deliver it to our house so that I could mulch some of the garden. It certainly went the distance at about 12 cubic metres a truck load it did the front yard, several bags, a couple of areas of the back garden and the chook yard – up to about a foot thick in some places. 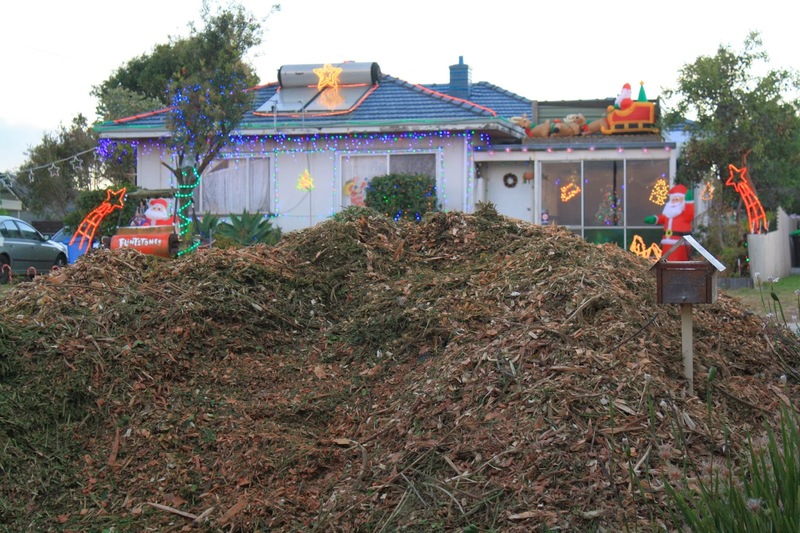 As daunting as the initial pile was – particularly as it was perched on half of our driveway and was nearly covering the letterbox – previous experience has taught me that the effort is worth it. A very large pile of mulch on Friday afternoon. By Friday evening we could see the neighbour’s house – nearly. The new look chook yard with a large compost pile and Blue Banana Pumpkin. This was a pleasure to do as it made the chook pen look a whole lot nicer than the previous ground cover of grass and weeds that had been put in there from weeding the Community Garden. 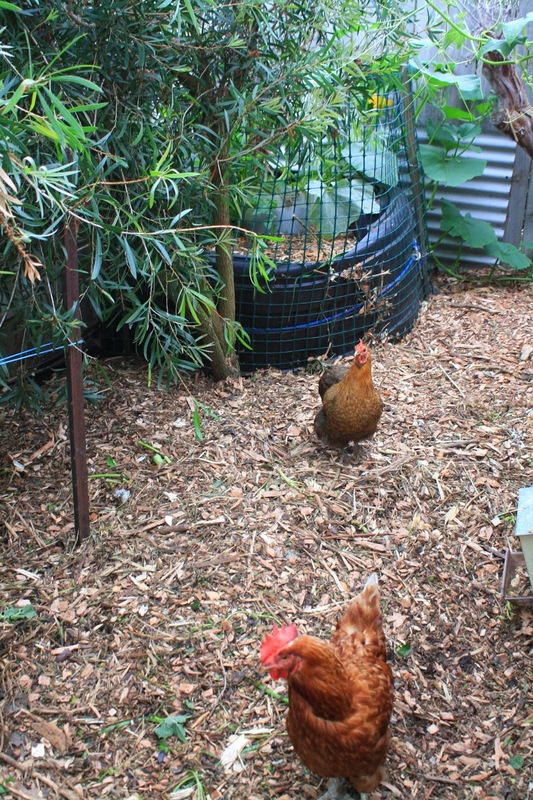 As much as the chooks loved it, it soon wore down and the mulch still allows them to have a good scratch around while I have left areas of dirt for them to have their dust baths. I also want to see how it wears because I am thinking of utilising this deep litter method at the new garden. By Saturday lunch I had the rest of the mulch moved with some much appreciated help from my Dad! 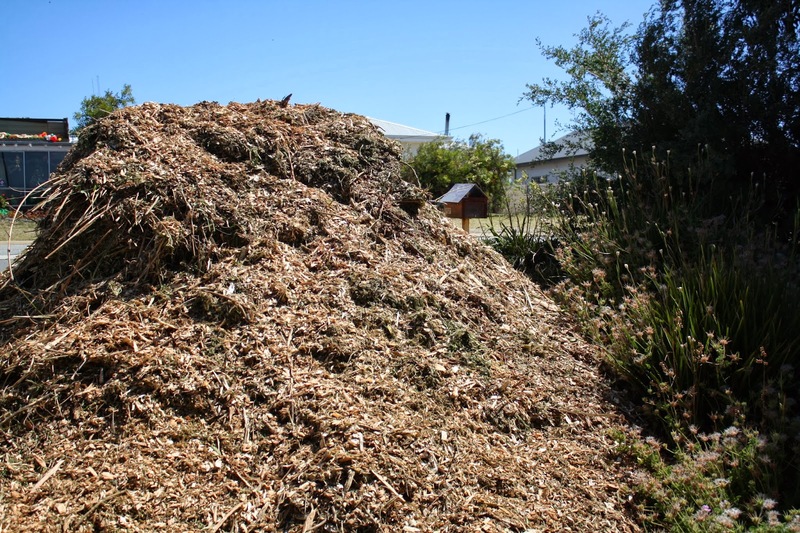 The backyard smells wonderful with the woodchips of lilly pilly, pepper tree and peppermint tree.